Our new CD, released August of 2000: Little Golden Bee, is now available from the College Store! The CD, Little Golden Bee, contains authentic folk songs from all over Russia, including traditional Christmas music and Cossack Songs. 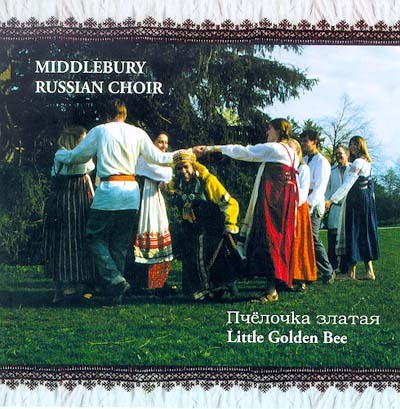 Featuring Middlebury Russian Choir 2000: Carolyn Ashby, Abi Butler, Maciej Ceglowski, Greg Ferguson-Cradler, Gentian Falstrom, Roza Ibragimova, Jessica Pasko, Lucy Roberts, Jenny Stroud, Laura Tarimo, Katie Tsuji. I will go out on the street and dance the khorovod! My boyfriend is standing in the doorway, he won't let me go out, but I'm not afraid him, I will go out. My dear one came in from the fields. He has a headache and can't wait till the evening when he'll send a matchmaker. The girl is pacing her room, wringing her hands. Rhyming couplets: We fell in love with the cook, whenever he turns up he brings us butter and cottage cheese. Our boys are so crazy, they propose to seven girls in one night! Sing any song you like, girlfriend, only don't sing any about love, don't trouble my heart! I remember two porches: on one we fell in love, on the other we parted. I long for the one who is away. He gave me a ring, I put it under my pillow to dream of him at night and woke up bathed in bitter tears. Porushka, why do you love Ivan? Because of his curly hair and his curly beard. He tells me that I've burned up his heart even without fire. Where have you gone, curly-headed Igor? Come back, I have something to say! Did a storm blow you away or were there not enough girls in the village for you? Autumn, why have you come so early? The jackdaws were flying in three pairs, the cuckoo flew crosswise. The girls sat down to sing, Klava started crying. Klava, your time has come! I will go out to the river and sit on the bank to wait for my dear one. Remember how we used to meet? Now I am not waiting, my dear one has come to me. During the Christmas season groups of singers would go from house to house and threaten to play tricks on their hosts if they didn't get a handout. There was much shouting to scare away the evil spirits that were thought to be abroad at this time. Then they would bless the house and wish the hosts a good harvest in the coming year. Marina with your red face and lousy head! If you don't give us a pirog, we'll take your cow by the horns! If you don't give us an egg, you'll lose your boyfriend! God grant this house a good and generous evening, a good harvest of rye, and all manner of riches. The little bird of plenty has flown in, bringing a good harvest, money, and fertility among the livestock. The goat went to the market to buy a scythe to cut the grass to feed the horse to pull the wagon to bring the wood to build the road so the three brothers could walk on it: the sun, the moon, and the rain. A little boat sails over the sea, Kolya's in the boat whittling. Holy evening. Don't aim at the eagle, aim at the King. He'll give you rich garments. Good evening to you, host, be joyful: Christ is born! Greet the guests and set the table. Serve a wheat bread to the whole house. In the field the Lord is plowing, holy evening, good evening, for all good people. His mother comes to bring him his lunch. She suggests sowing wheat in the field. Green grass, I walk the horse across the grass. My dear one is leaving as soon as he came. Why are you leaving me? I'll be left home alone afraid to sleep. A storm rages in the Carpathian Mountains, the accursed Germans have attacked us. They want the Cossacks to go serve their throne, but the Cossacks are brave, they won't go. A river flows down from the Caucasus Mountains. There's a bush by the river and a gray eagle in the bush; he holds a black crow in his talons. Oh little golden bee, why are you buzzing? You fly all around and don't fly away. I'll glue myself to her lips and die. You're fooling, you won't glue yourself; you lie, you won't die.